Twig & Thistle: Free PrintablesLove this site and blog...Twig & Thistle (besides a super cute name) always have such great ideas and how to wrap up those ideas on their sites. Be sure to bookmark them. 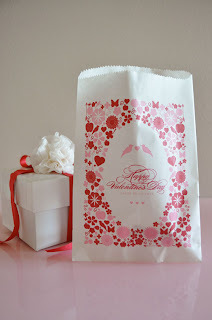 But they have this fun download and you can easily print off these darling treat bags at home. The HARF...when hat meets scarf! I saw this shown on Studio 5 and it actually made me want to learn to knit...and I have never felt the urge to knit (wink). But what a cleaver idea and I think they're super cute. Check out the gals Etsy Shop here if you want to see more. She's a local craft from Utah too! FELT ROSES by Prima I saw this photo taken at the recent CHA trade show and thought how beautiful a scrapbook embellishment could make a bag or a hoodie, or anything...cute huh? Prima also created the fun canvas messenger bag. Teresa Collin's booth...love her style! I believe this was a donation to raise money at the World's Largest Crop held prior to CHA. But WOW...I would frame that for sure and hang it in my house! 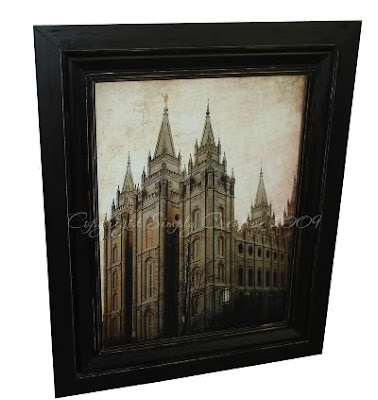 You might have seen these beautiful antiqued poster sized prints of Temples at Deseret Book or Seagull Book and they were WAY out of your price range?? 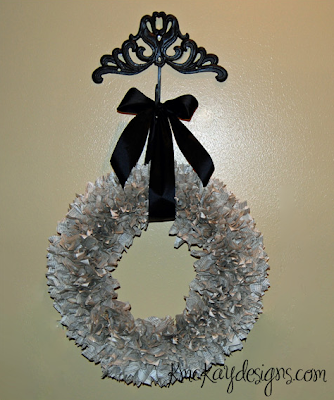 Join me for this workshop and you can make one of these for only $50.00 total...includes frame too!! More details below and pictures of the Temples pictures available. Email me if you are interested and I'll reserve your spot. 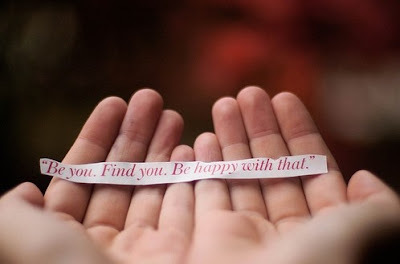 A THOUGHT....I loved this photo when I saw it in Liz Kartchner's blog and saved it...figured I should share. NECKLACE I tend to save photos and forget where I found them, but I'm pretty sure that the very talented, Margorie Romney-Aslett posted it to her blog or twittered about it...not sure, but I'm giving her the credit. SCRAPBOOK PHOTO FRAME What a fun idea and one I'm for sure going to recreate. Found this idea on the Silhouette's blog and was created by Kerri...love it!! Check out their blog for close-ups. 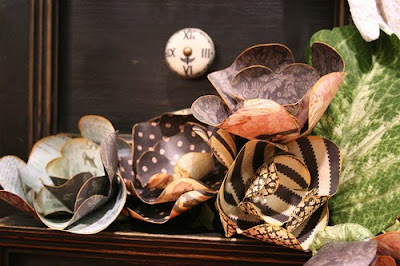 Loved these darling "Petal Pushers"...just want to know who to make them now...it's an obsession of mine!! I've had a few friends tell me that they love to read my blog, especially when I post links to other great blogs and crafty creations. So I thought I would be fun to feature my "Favorite Finds" I happen upon throughout the week. So here are my finds for this week...gotta love em!! Old Book Wreath by Kristine McKay Watched Kristine on Studio 5 this week...I'm a big fan of dictionary flowers and loved that she was tearing apart old books to make such cute ideas. Check out her site to see more cute projects made from old books! The Idea Room's Felt Heart Wreath Seems like a lot of work, but soooo cute. She even created cute balls with this technique...I'm thinking red and green balls for my Christmas tree next year...yes? Door Magnet Board from my neighbor Cassandra (Cassandra Designs) Isn't she the coolest neighbor ever...I so wish she'd come help decorate my house!